Who are you: My name is Sally Jane Linville, Creative Director of The City Girl Farm. I am also a wife, new mother, daughter, sister, and friend. What is your business: The City Girl Farm is a community of artisans sculpting beloved 'Chicken Footstools' together. The idea was inspired by memories of childhood pet chickens, pining after the sheep sculptures by Claude and Francois-Xavier Lalanne, and exploration of traditional art processes. Every chicken is one-of-a-kind, unique in posture and personality.A turned wood egg-shaped core stands on bronze feet and is connected to a bronze beak. Feathers are fashioned with various fiber art techniques- felting, spinning, knitting, dyeing- and are upholstered by hand. The chickens can function as footstools and are the best at making people smile! Where are you located:We design and fashion Chicken Footstools at thecgf studio in midtown Kansas City, Missouri. Bronze is cast outside of Lawrence, Kansas, and wooden eggs are turned in Hesston, Kansas. Each chicken's internal frame is constructed by my father at our family farm in Lyons, Kansas. Tell us about your process to becoming a maker: I grew up on a third generation farm in central Kansas. My father is a crop farmer and my mother is a designer, with a lifelong interest in textiles. Childhood adventures flowed with the rhythms of our farm, family and rural community. I attended Kansas State University where I received a Masters in Interior Architecture and Product Design. My professors fostered a collaborative studio environment for students to explore curiosities and design process. Henny and Penny, the original Chicken Footstools, hatched from a furniture design/build studio in my last year of school. Did you come from the corporate world: No, I side-stepped it making chickens. Were you always a maker: I have always enjoyed lovingly arranging things- whether flowers in a vase, letters on a page, chocolate chips in a cookie, or rooms in my treehouse by the creek. Childhood on the farm provided plenty of time, natural resources and visiting cousins for creative play. How did you decide you were finally ready to be a maker: In 2010 when graduation came, the design job market was less-than flourishing. I embraced the opportunity to move back home to prepare chickens for an upcoming show in New York. After that, I planned to begin my search for a 'real job.' Seven years later I have a fiber studio in Kansas City making chickens with friends! Why are you still a maker: Thankfully, the work of head-chickener requires me to engage my hands in fiber every day. Is this your main job: For the last four years, yes, but now I am a new mother to our precious daughter, Analou Pearl. Our world is forever changed! I am just beginning to discover what bringing her sweet presence into life at studio life will inspire. As a child what did you want to be: Treasured. Tell us about your creative process and the evolution of that process as you've perfect your craft and as you've grown as a business: While the basic form of our chickens is now established, the sky is the limit when feathering time comes. Playing with a variety of fibers brings a fresh set of opportunities and challenges to each fashioning. I am most creative when I am present in the moment, responding to the materials in front of me. I love collaborating so incorporating more makers as the business grows is a joy; I learn so much alongside them. What inspires you: Right now on my walk with Analou: a poppy-red zinnia, the curve of her foot, refreshing breeze on my face, afternoon prayer with a friend, and the hope of fall. Moments like these remind me I am a small yet special part of a grand, good, mysterious, beautiful design. And so is my neighbor. Who inspires you: With the miracle of birth fresh in my heart, I believe inspiration can be found in every person. We are all specially made with particular gifts for the good of the world. I am inspired by so many people, particularly those who show kindness and hospitality, and all who are brave to love after loss. Who has been your biggest champion as you've progressed as being a maker: My mother and I have shared years of creative life together. My dad is a huge fan of Chicken Footstools, telling people about them even when they can't quite grasp the concept. The delight my parents take in me has been an encouragement through every season of life. How have you grown your business: The City Girl Farm has grown with the support of my family, my business partner and the willing hands of my 'chickeners.' For several years, Chicken Footstools were stitched by myself, my sister and my mother. When the demand for chickens exceeded our stitching capacity I reached out to old friends from studio days. We gathered for weekly 'chickening' sessions and shared life together. Now the business operates as a cottage industry where chickeners stitch under my direction both at thecgf studio and at home. How have you perfected what you make: There is no substitute for years of sitting behind Chicken Footstools stitching tail-feathers. I have found that the materials often guide the project and confidence that any 'mistake' can be made beautiful with creative problem-solving. Every chicken has quirks (who doesn't? ), but I have learned to embrace them and hope our collectors agree. Has this grown been easy: Let's call it bittersweet. The process of recognizing my weaknesses and limits, asking for help and releasing control does not always feel good. Waiting for right timing can be frustrating. Stewarding relationships and resources is real responsibility. But the reward? 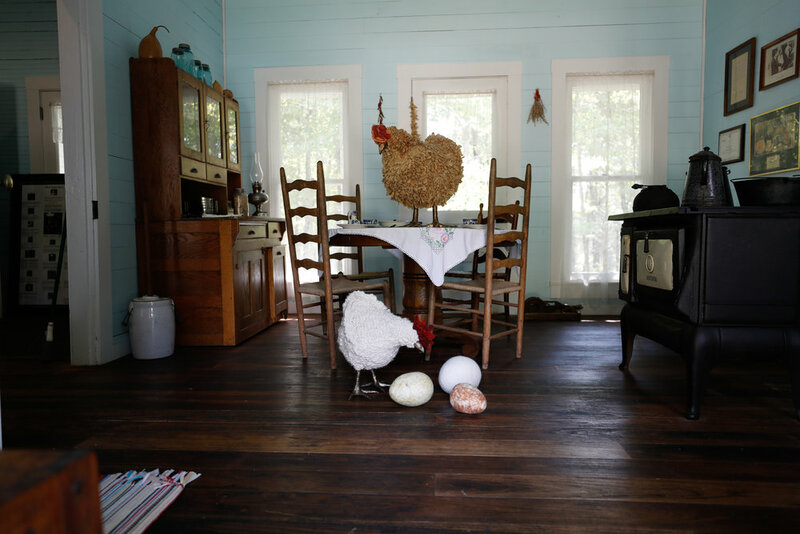 A vibrant, authentic community of makers, beautiful chickens and a whole lot more fun. What advice would you give based on your own experience: Surround yourself with people who believe in you. Seek out the gifts and wisdom in others. Be patient through seasons of questions and sit with one another in grief. Celebrate all that is good and lovely! Remember, the best is yet to come. What has been the most successful way to get your product out there: For several years, we primarily shared Chicken Footstools with the public through art fairs in the Midwest. People's reactions are true entertainment! They share stories from childhood, make the best chicken impersonations and are generally so bright and intentionally encouraging. We are honored and thrilled with every adoption that takes place- particularly from our collectors with growing flocks. Give us three tips you've learned as a maker that can be applied to everyday life: 1. Go for beautiful. 2. Start with what you've got. How can we find your products/where: Please follow our flock online at chickenfootstools.com and on social media @thecitygirlfarm. We post behind-the-scenes footage of our adventures and poll our audience for chicken names. If you are in the Kansas City area, contact me to schedule a visit to thecgf studio or swing by George Lifestyle, a lovely shop in Brookside, to meet Chicken Footstools in person. Why should we support and buy maker and American made: Handmade objects can be unique expressions of special people, times and places. I think surrounding ourselves with treasured objects that bring joy and hold a story worth sharing is a wonderful part of being human. How do you ensure quality of your brand and your products: The 'Art of Chickening' is a labor of love. Nothing is quickly made or touched by unfamiliar hands. We source all of our materials in the USA. Our artisans take cheery pride in their craftsmanship. Traditional manufacturing techniques encourage us as makers to slow down and enjoy the process of creation. When someone adopts a Chicken Footstool, we hope it is a family treasure for years to come. Is flannel always in season: Absolutely. In honor of its classic appeal and this fine Folk community, we are designing a Flannel Flock of Chicken Footstools to be released for adoption later this fall. Please stay tuned! How do you live authentically: I seek the Maker's beauty to keep my heart open, enlivened and ready to walk with others through this journey of life. My wonderful husband @evan.linville (suggestion: follow him!) love to adventure outdoors to witness creation together. How do you find the divide between work and personal: My co-workers are friends and family so my work/personal life has always been blended. A friend recently suggested that each day should contain work, play and rest. I am finding this idea simple, sweet and helpful in this season of transition into motherhood.